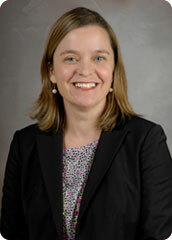 Dr. Susan Haldane Wootton, M.D. Susan H. Wootton, M.D. is an Assistant Professor of Pediatrics in the Division of Infectious Diseases at the University of Texas (UT) Medical School at Houston and member of UT’s Center for Clinical Research and Evidence Based Medicine. A graduate of Washington and Lee University and the Medical College of Georgia (1997), she completed her residency at the University of Virginia (2000). She served as an Epidemic Intelligence Officer with the Centers for Disease Control and Prevention (CDC) for two years (2000-2002) during which time she participated in the Stop Transmission of Polio Program in Nepal. After CDC, she completed her 3 year pediatric infectious disease fellowship (2002-2005) at Texas Children’s Hospital during which time she investigated the molecular epidemiology of tuberculosis and epidemiology of children hospitalized with rhinovirus infection. She was awarded the Ralph D. Feigin, M.D. Fellowship in Infectious Diseases all three years. After her fellowship, she completed a 1 yr. post-doctoral fellowship in vaccinology at the University of British Columbia’s Vaccine Evaluation Center in Vancouver, B.C. where she received extensive training in surveillance and vaccine trials. Since joining UT in 2007, Dr. Wootton has been involved in all levels of teaching (medical students, residents, fellows and faculty) and has received multiple research awards (Clinical Investigator Award 2008, CCTS Scholar Award 2008, CER KL2 Scholar Award 2010, UT System Grant 2014). Her research focuses on vaccine-preventable infections and she currently serves as Co-Chair for the Texas Pediatric Society Infectious Disease Committee and board member for The Immunization Partnership.